In this tutorial, we will learn how to develop a single page application(SPA) using Angular 6 as a front-end and Spring boot restful API as a backend. 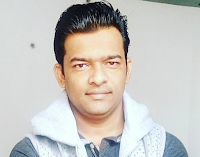 springboot2-jpa-crud-example: This project is used to develop CRUD RESTFul APIs for a simple Employee Management System using Spring Boot 2, JPA and MySQL as a database. angular6-springboot-client: This project is used to develop single page application using Angular 6 as front-end technology. This angular 6 application consumes CRUD Restful APIs developed and exposed by a springboot2-jpa-crud-example project. Let me list out tools and technologies used to develop these two applications. Let's first we will build a CRUD RESTFul APIs for a Simple Employee Management System using Spring Boot 2 JPA and MySQL. Later we will consume these Rest APIs using Angular 6 client application. Following are five REST APIs (Controller handler methods) are created for Employee resource. There are many ways to create a Spring Boot application. The simplest way is to use Spring Initializrat http://start.spring.io/, which is an online Spring Boot application generator. Or you can start spring boot application via command line using mvn spring-boot:run command. This completes the development of Spring boot CRUD Rest APIs. Now we will develop client application using Angular 6. Let's develop a step by step Angular 6 SPA(single page application) to consume above CRUD rest APIs. I am assuming that you have basic knowledge of using Angular 6 and Angular CLI. We will using bootstrap 4 for styling our application so let's integrate bootstrap 4 with angular 6. Hello and thanks for the tutorial. I don't know why is trying to call the URL with the port 4200, it should be with the port of the backend 8080. Can you help me please. Angular application is running on port 4200 and spring boot is running on 8080 port. You need to specify full rest API URL like http://localhost:8080/api/v1/employees to call rest APIs of spring boot application. I have used proxy configuration to avoid CSRF related issues. Replace "api/v1/employees" with "http://localhost:8080/api/v1/employees" in EmployeeService class then it should work.